My friend Manu had just got back from Morocco and was near Cadiz so we decided to meet at a small town called Arcos de le Frontera in the Andalucia region of Spain. 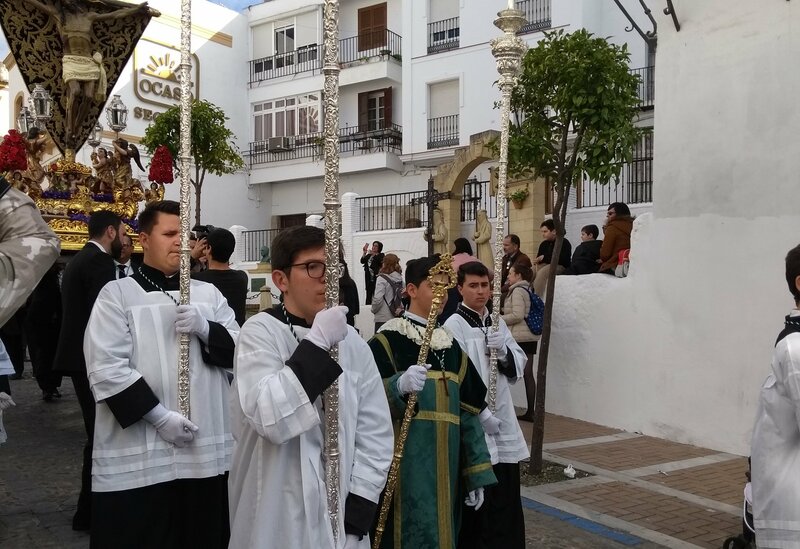 Little did we know but there was a religious festival happening for the whole week of Easter with parades and celebrations in the town, one of hundreds of events occurring throughout the region that week. We were lucky enough to arrive just in time for one of the processions. People lined the streets while the “Ensacados” or masked penitents took their places, waiting to walk in celebration of the crucifixion and resurrection of Jesus Christ. It was quite creepy, with the tall, pointed hoods and long, white robes comparison to the Klu Klux Klan was unavoidable. They carried huge candles which would be lit after dark as the festivities continued. After rows and rows of hooded figures passed, a group of men arrived carrying an effigy of Christ on a golden platter, it looked really heavy! The effigy was followed by a squadron of Roman soldiers marching to the beat of a loud drum. They stopped and formed up right in front of us, changing formation with shouts from the Commander. This is what I love about travelling. So often you’ll park up in an unknown town completely unaware of some big happening or event and be plunged straight into the middle of something unexpected. Before last week I had no idea about this celebration, now I’ve experienced it first hand. Every day’s a school day, eh!